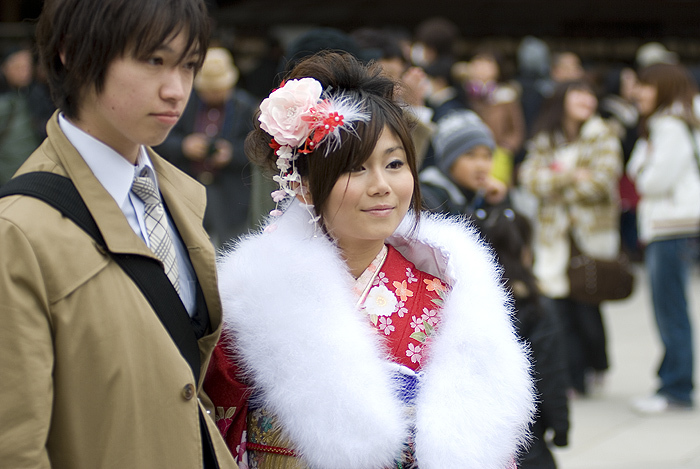 Photographing young Japanese girls in kimonos on Coming of Age Day is practically a cliche nowadays. 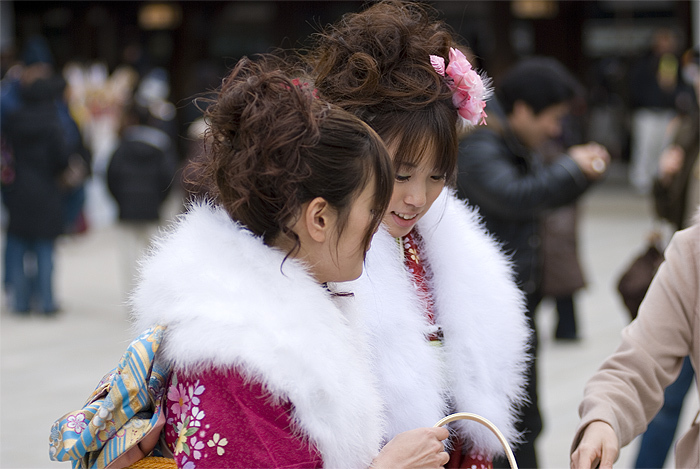 Type said holiday into google search and you'll be presented with millions of photographs of kimono clad girls celebrating their acceptance into adulthood. No doubt every person calling themselves a photographer and living in Japan has tackled this subject, excepting myself, which was my main reason for doing it. I was totally unprepared for what awaited me when I got to Meiji Shrine however. I expected it to be full of colourful kimono wearing girls in every direction, but what I got was a massive horde of camera toting photographers who swarmed the extremely tiny percentage of girls in kimonos, maybe 1:1000, like they were movie stars walking down the red carpet at the Oscars. Seriously. I'd expected to have to go up to some girls, and ask if I could take their pictures, but there was no need. 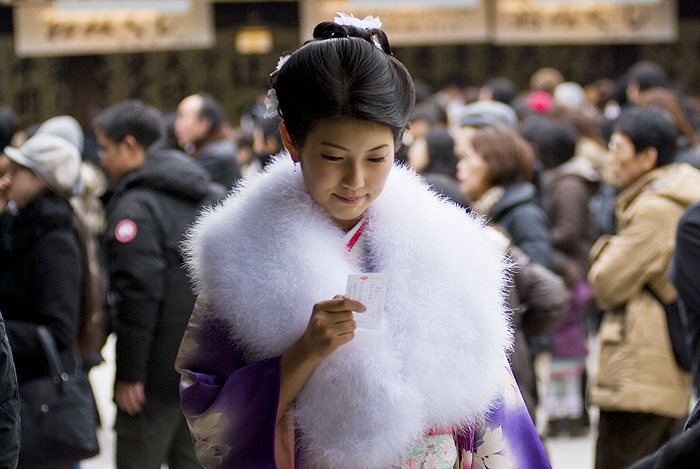 As soon as any girl in a kimono set food inside the temple grounds, the photographers (mostly old Japanese men) rushed her, encircled her, and started taking pictures, usually whether she wanted them too or not. So I found myself following the more zealous guys and doing the same thing. I didn't feel so good about it, but when in Rome I guess. 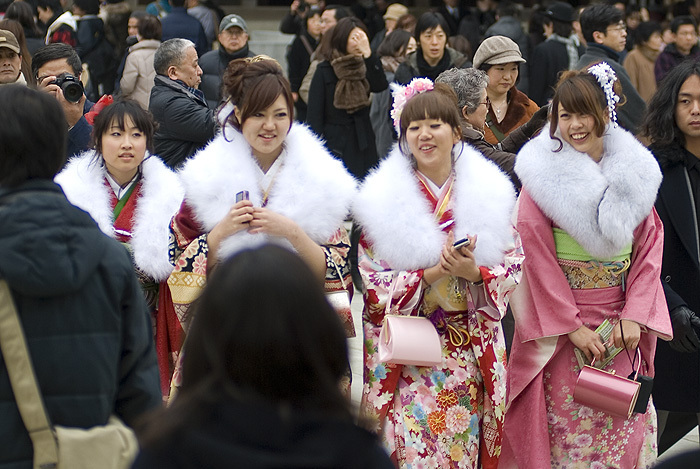 The number of girls wearing kimonos really was extremely small, it seems that given the expense involved, it's starting to lose its popularity. Coming of Age day isn't just for girls of course, but the days where the guys also wear kimonos along with the girls has long faded away. Only a tiny percentage of men wear traditional clothes now, most preferring to wear a suit, or just a shirt and tie. 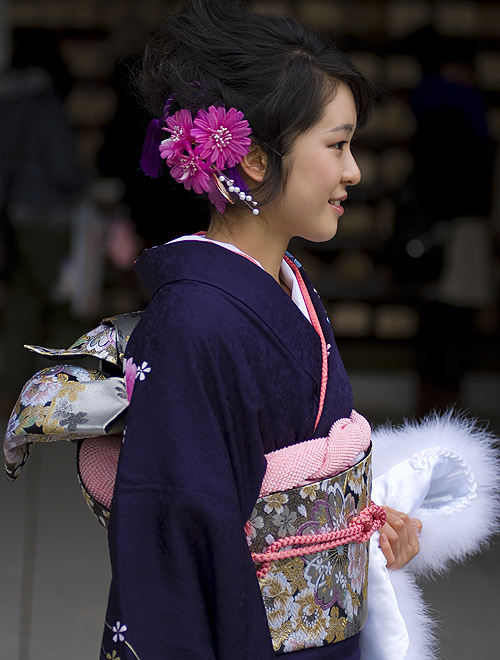 One reason for the lack of girls in kimonos may have been the fact that the Coming of Age Day celebration is generally finished in the morning. I arrived at Meiji Shrine around 1:00 pm, but perhaps if I'd gotten there much earlier I could've seen more. Some of the photographers were quite aggressive, telling the girls to pose this and that way, to take off their fur scarves and smile, etc., but the girls bore it quite well, not minding that hundreds of complete strangers had lenses pointed at them. Maybe someone had warned them beforehand. Still, there was no way for them to stop the flood of clicks except by just walking away, which they all did after a few minutes of patient posing. And now there are 7 more pics to add to that list of 69,000,000 or so other photographs! Thanks to the girls for their patience!